72 90% LEAD LEGS. Really slowed me down. I wonder if this means I am related to Superman. Getting warm down here. 64/64/100%.Lots of fog this morning. Base run, 10x30s striders @ sub 5K pace. 90s recoveries. A few days left of unplugging then back to Ohio. 72/72/96%. The classic. 10 mile warm up. 6 x 3 Min @ 6:50ish w. 2 Min recoveries. 2 Mile strecth out before the 16.5 hour drive. Ugh. Humid. Good week at Siesta which had some good running. Also not logged was 3 bike miles and 15 walking miles on the beach. Good evening cross training. Back to Ohio. Back in Ohio. Running temps from 75 to 39. Colder tomorrow. Tough. Oh well, I overdressed. Home sweet home. 23 degrees. 52 degree drop from my Wed run. A loud welcome home. Overall though, a decent run. I felt good the whole time. 5 beginning and end were just base running with the 6 in the middle at MP. Quiet morning outside, only 1 other runner and just calm. I will take it. Sunday afternoon easy recovery. Wind was annoying. Food and football is also good. More cold and snow. I took Tuesday off as the freezing rain just made it too treacherous. A freind of my that is an apt manager let me use their treadmills. So I ran the classic. 10 Miles warm up. Then 6x3min intervals with 2 min recoveries. Pace 6:53, 6:53, 6:53, 6:53, 6:53, 6:00. Cooldown. Cold run. 18 degrees with snow and ice. Slow recovery, much needed. Quads are sore from yesterday. 12 degrees. Some snow. 11 Striders @20sec w/40s recovery. Roughly 3-5k effort, but snow slows one down. Frustrating running weekend as the bitter cold and wind kept me off the roads for the first time this winter. Today was 4 inches of snow and freezing rain. 10 miles in the time I would normally run 12-13 miles. So effort and time put in today. 32 degrees, more freezing rain. 7.5 crunchy miles. Is making my legs sore. High today will be 35. I hope its enought to melt some of the ice off - I want to do intervals tomorrow. More snow and ice. Slick conditions and a lot of resistance. 30 degrees. 11.25 in OVER 2 hours. Ridiculous how much the slow is slowing me down. 26, bit chilly, but the warmer afternoon yesterday and the little sun this morning made the sidewalks clear of snow. We have some warmer weather coming tonight, tomorrow and Saturday so heres hoping for some better runs! 40! Snow melted off the sidewalks and bike paths. good run. 11x20s striders. Should be a good Saturday long run. 45 at the start! Great temps for a run. It was windy, but I will take it. At the end of the run it was 65. 4 miles warm up and then 9 MP miles (roughly the 7:40's) and then cool down. LOTS of runners on the bike path and most running fairly quick. 51, good temps, bad wind. Legs were tired. Recovery 7. Treadmill, southern KY- 8 miles. 9 striders @ 30s 5K pace with 90s inbetween. The semi classic. Wore out from 15 hours of driving the last few days and the hotel treadmill, I was not feeling it. 9 mile warm up and then 5 intervals - 3 Min @ 6:53 with 2 Min recoveries. Back home. Over 1000 miles driving in the past 4 days. 32 degrees, windy. Felt good to get outside and off the treadmill. another 32 degrees. Legs were tired. 11 Striders @ 20s 3k pace with 40s inbetween. Would like a good long run tomorrow. 30 degrees. Character building run if there is such a thing. I had a 5 mile warm up where I just felt lousy. No energy, no much legs, but I wanted to run half the long run an MP. 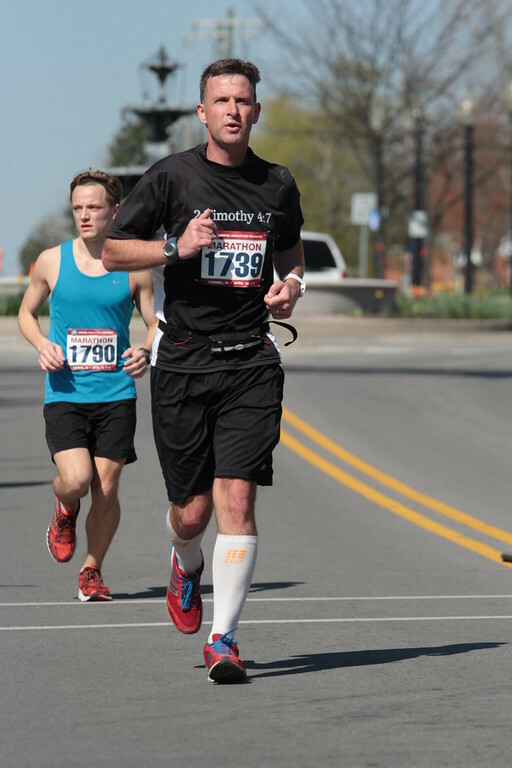 So at mile 5 I sucked it up and hit my goal BQ pace (7:52) and held that or better for 10 straight miles and then had 5 cool down. While that is not really impressive I felt good about it since I felt like garbage.